The Ruffwear – K-9 Float Coat for Dogs is a high-quality life jacket designed for your dog. It has a heavy-duty reinforced grab handle that lets you control your dog the dog if he falls into the water. When canoeing you know, it’s hard to pick up a big dog out of the water; simply grab the handle pull the dog back into the canoe. It’s designed to hold up even while carrying heavier dogs and is securely attached to the main body of the life vest. The reflective stripes on the side and the top make it easier to see your dog in low light conditions. This dog life jacket features a telescoping neck section and two adjustable straps along the body which prevents the dog from slipping out of the jacket without compromising comfort. 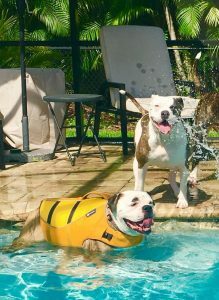 Using a dog life jacket is always recommended, even if your dog is a strong swimmer because in the event of an accident your dog will be much more visible and will stay afloat, especially when he’s too tired from swimming. The Ruffwear – K-9 Float Coat for Dogs is available in two colors, red and yellow, and six sizes, from extra-extra-small to extra-large, so it can fit on any kind of dog. Putting on the Float Coat is easy, just slide it over the dog’s head, pull down the straps, reach under, pull the straps through and connect the buckles. Snug them up nice and tight and then adjust the telescoping neck by pulling the front strap. Clean up all the tail ends of the straps to keep them from dangling in the water, and you’re ready to go. The Ruffwear – K-9 Float Coat also features a light loop for attaching a beacon and is backed by an impressive lifetime warranty. It’s really quick to dry and doesn’t hold the wet-dog smell afterward which is a huge plus. To clean it you just hand-wash with a mild detergent and air-dry. Overall, the Ruffwear – K-9 Float Coat for Dogs is a highly well-designed dog lifejacket, and Ruffwear has great attention to detail. The look of this light vest is eye-catching, and the construction and durability are top-notch, unlike many other dog lifejackets on the market. If you ever run into any issues just give them a call, and their excellent customer service department will be ready and willing to make it right to you.